A great colour value for your desktop or small office, the Lexmark C540n is extremely compact, ultra-quiet and offers you true 1200 x 1200 dpi colour to liven up your business documents. When it's a boost in performance you need, you can count on rapid print speeds up to 20 ppm in both black and colour, plus a rapid first page out as fast as 12 seconds in black, thanks to the instant warm-up fuser. Set-up is quick and easy with built-in networking. And consider adding a Duo Drawer option which includes a multipurpose feeder to print on various media types. If you need a hard working business printer to share with others in a small office, the C540n is ready to meet your needs. With a built in Ethernet port and installation software, it will be ready for everyone in your office to take advantage of the excellent quality prints in no time. 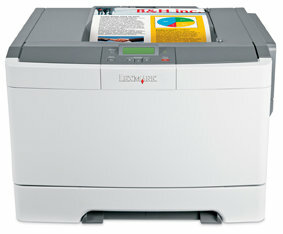 The C540n is covered by a one-year Lexmark guarantee. Plus, in the unlikely event that anything should go wrong, Lexmark will send a fully trained engineer to your home or office to fix the problem for you. With a next business day response time, you can be sure that down-time will be minimised. The Energy Star is an international standard awarded only to those electrical products that are designed to allow users to save energy when using them. All Lexmark printers have the Energy Star rating, so you can be sure your printer is minimising its impact on the environment and your electricity bill. Lexmark's high quality 1,000 page black and 1,000 page colour toner cartridges are included in the box with the printer so you can start printing as soon as you are set-up. Lexmark offer the option of high yield 2,500 page black and 2,000 colour page toners as replacements, which have even lower costs per page and save time on changing toners over. 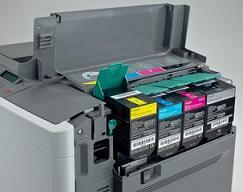 With Lexmark laser printers, you only replace the toners and photoconductor units as and when they are needed. This means there is no waste and the costs are kept to a minimum. Plus, with the Lexmark Cartridge Collection Programme, you can return your empty toners, free of charge and Lexmark ensure that they are re-filled and re-used, helping reduce the environmental impact of the printer. Print responsibly with a wide range of eco-conscious features, including Lexmark's Eco-Mode and new instant warm-up fuser to reduce energy consumption, while delivering first page quickly. The standard input capacity is 250 pages however if you need more capacity opt for the additional 650-sheet drawer which includes a 100-page multipurpose feeder, so you can run diverse media types and boost your total input capacity up to 900 sheets.